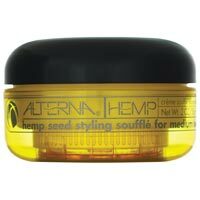 Alterna Hemp Souffle protects and strengthens hair while addressing an array of styling needs. A workable, medium hold with weightless conditioning agents. Enriched with hemp seed oil and nutrient activating enzymes, this water based, wonderfully whipped formula safeguards the hair with powerful environmental protectants. Benefits: Acts as a thermal protectant. Specialized proteins bind damaged areas while smoothing frayed cuticles. Provides protection from damage due to thermal styling. Creates weightless texture and hold. Directions For Use: Apply a generous quantity to clean towel-dried hair. Work thought the hair, moving from the roots to the ends. Style as usual, with or without heat.